Background The Celestial Eye came into existence through mutations of the Red Telescope. Differences between the Telescope and the Celestial Eye include its upward-turning eyeballs and lack of dorsal fin. It is named Celestial Eye because its eyes face upwards. It is said that the position of its eyes changed over many generations from being on the side to the top because it sought light during its breeding process in a narrow jar. Features The characteristics of the Celestial Eye are its upward-turning eyes and lack of dorsal fin. Along with the Bubble Eye, it is the representative of Chinese goldfish with its unique and funny appearance. Acquisition difficulties Somewhat difficult. Although its unique appearance is an attractive feature of the Celestial Eye, it is not favored by Japanese people. Therefore, there is less demand for this goldfish and distribution amounts are relatively low. Rearing difficulties Normal. Although there are no particular difficulties, it is not a strong kind of goldfish. Details of the above photo The Celestial Eye in the photo is the goldfish displayed at Goldfish Hall in Nagasu, Kumamoto Prefecture (a goldfish breeding district in Kyushu). Their English name is ‘Celestial Goldfish’ (meaning an astral goldfish). 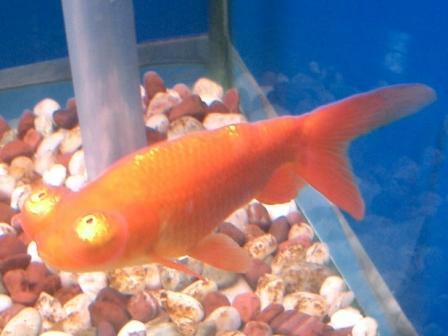 Telescope-type goldfish such as the Telescope, the Bubble Eye and the Celestial are said to have very low eyesight.